Economic hubs have many components that make them successful. The most important aspect is they work like a system where the proper elements must be drawn into that environment to make it work properly. When one of these components is missing the entire system will lag much like we are seeing in the overall U.S. competitive environment. Government is one component that is not included in the above diagram because they are the "brains" behind the system that ensures, in conjunction with local stakeholders, proper direction to ensure the elements are present. Such governments help ensure the proper tax structure, fair laws, and infrastructure are available. We see that as a system we have inputs and outputs. As resources come into the system they are used, evaluated, changed, and improved into finished products. This happens through the interactions between suppliers and the supply chain. 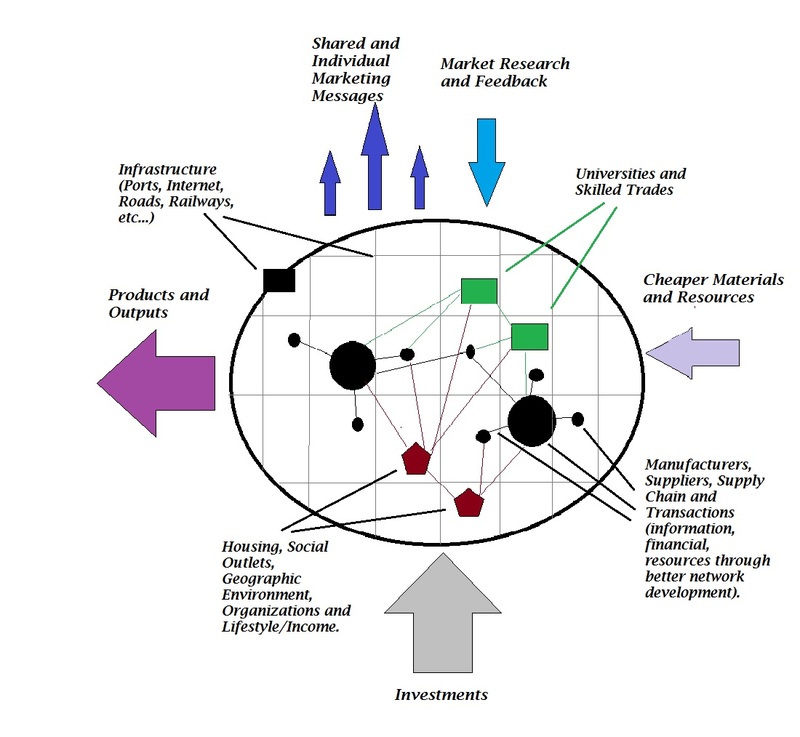 There must be adequate interchange of financial, material, network development and information to create innovation. Of course the system won't work very well without needed capital. The intellectual and physical skills and abilities developed from universities and training are important in ensuring that the right kinds of skills are available for global competition. The system will also need access to investment capital as drawn from loans and outside investors that speed up the transactions between organizations in a way that returns investment. You may also notice that it will be hard to draw in appropriate skills and abilities without an attractive lifestyle and social interactions that not only improve the quality of life but also the spill over information. A positive lifestyle will also contribute to political stability and retention of top talent. The overall infrastructure of the area is vitally important to the full functioning of the system. An export oriented infrastructure with ports, railways, roads, high speed Internet, and utilities will encourage the drawing of investment but also the overall success of the business within the hub. Finally, you will notice that it isn't enough to have a great system in place without advertising it appropriately. The government, organizations and businesses have a stake in ensuring that their product and place are well known to both customers and potential investors. To be successful they will continually need to have feedback loops that improve the functioning of their business through alignment to market needs.